This shoe became an industry standard for a solid everyday application. The generic pattern allows for easy front or hind shaping while the dimensions offered excellent durability and reset options. 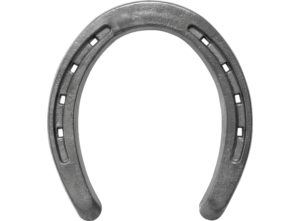 This is America's basic flat creased horseshoe, designed for versatile use wherever you shoe, and is punched for a CH5 nail. 1-9 $6.25/pr. 10-49 $5.80/pr. 50+ $5.65/pr.